What! The lowly split shot is one of the most important weapons at our disposal. I find it interesting that the traditionalist tenkara angler will talk about blasting their kebari into a riffle to get it to sink when a Dinsmore size 10 split shot will do a much better job and leave you with more control over the fly. My use of split shot and Tenkara Rods goes back to my fly fishing days. Most fly fisherman had sinking head or sinking lines. Using split shot mimics a sinking head if you do it right. My inspiration sharing these thoughts tonight comes from my experience using the Diawa .4 gram spoons. I have several of the .8 gram spoons, but they don't cast well with the TenkaraBum 40. Today, I found that two Dinsmore #10 split shot spaced 4 inches and 6 inches above the spoon got it deep enough to get the spoon down to the fish. It was a "many" day. The Dinsmore #10 split shot only weighs .06 grams. With .12 grams of split shot, I was able to get the .4g spoon deeper than a .8 gram spoon! With the addition of only .12 grams, my casting wasn't affected much at all. To get the total weight of a .8 gram spoon, I would have had to fish a BB size split shot! We often read and talk about covering the water. The reality is the water we are fishing is 3 dimensional. Unless you are strictly dry-fly fishing, you will want to explore the depth where the fish are hanging out. I have found using split shot to be very effective in exploring the depth. Rather than going heavy to get to the bottom first, I have found working from the top to bottom is much more effective and less frustrating. Several times this summer just one Dinsmore #10 got the fly or worm at a depth where the fish were feeding. A size 6 split shot weighs .1 grams. I fished a size 6 a lot in the streams and rivers this summer. Size 4 weights .2 grams, size 1 weights .3 grams, and BB size weighs .4 grams. Most of the time, I prefer to only have one or two shot on the line. I have a good friend in England who has been teaching me about using a tapered spread of shot to control the line even more. 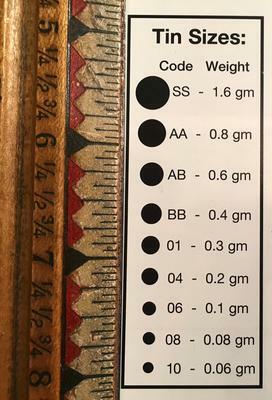 So instead of a .4 gram BB shot if that is what it takes to get to the right level, use a size 1 and a size 6 with the 6 closest to the fly or worm. Make fine tuning adjustments with one or two Size 10 split shot. This has worked very well for me in very clear water where the "big" splash of a BB would scare the fish. By using spacing, the drift can be very effectively controlled. The rig makes a nice controlled sweep as it goes through the water column. I have a lot more experimenting to do. Anything more that .8 grams for me takes the fun out of casting. There is a nice selection of split shot sold here. I have found them to be an indispensable part of my equipment and strategy to catch fish. I would recommend a basic set. For even more fine tuning there is a size #11 at 0.03g, size #12 at 0.02g, and size #13 at 0.01g. Most of us have no qualms fishing beadhead flies, why not just move that weight 4-8 inches further up the line? Les, loved your article on split-shot however, im a visual kind of guy so all those numbers mean "nada" to me. Can you lay out the shots next to a penny or ruler or some form of measurement and take a photo? Thanks, Tim. I have a photo I will attach to Les' article. I did a lot of research on line trying to convert split shot weight from grams to fractions in ounces because that is how many rods state the limits of lure sizes. These may be off just a little, but so close not to make a difference. I hope this helps some of you because it help me to ensure, I always stayed within the limits of my rod. I know it's a little #@$% retentive, but being retired Army makes us that way. Alton and Chris, it looks like the differences in your split-shot weights come about because one (unknown brand) is made of lead and one (Dinsmores) is made of tin. Comparing Water Gremlin's lead and tin BB sizes, you get weight differences of .56g vs .35g. Comparable to the differences between your two examples..... To get the same results of lead with tin, you're going to be doing more crimping, which isn't necessarily a bad thing as Les learned from his British friend. Easy solution to the dilemma: Buy the best from you and forget the rest. Too much thinking spoils the fishing. I just looked at the Water Gremlin website. They just use a different numbering system than Dinsmore does. I have no doubt that Alton's numbers are right, and the difference has nothing to do with lead vs. tin. The two companies just number their sizes differently.